FIGURE 2: Different models of biofilm formation in M. tuberculosis. (A) Pellicle biofilm model of M. tuberculosis. The pellicle biofilm matures through several stages of development in around 5-7 weeks. These biofilms are rich in free mycolic acids. (B-C) Thiol reductive stress induced biofilm of M. tuberculosis. This model is induced by thiol reductive stress generated by reduced DTT. This polysaccharide rich biofilm of Mtb takes around 29 hours to develop. Keeping the culture flask at standing position generates a biofilm that attaches to the bottom surface of the flask (B), whereas shaking of the culture leads to biofilm formation at the liquid-air interface (C). 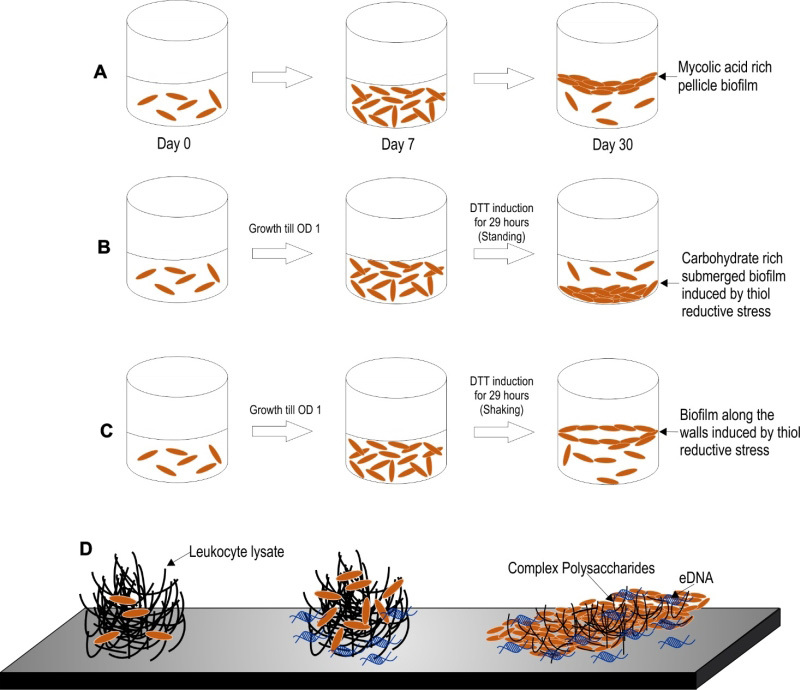 (D) Leukocyte lysate induced biofilm model of M. tuberculosis. This eDNA rich biofilm of Mtb takes around 7 days to develop. This model may depict the biofilms formed inside the granuloma, wherein leukocyte lysate is available due to cell lysis induced by Mtb cells.